GET YOUR MP TO SIGN THE EDM, discuss what else they can do. an EARLY DAY MOTION (EDM)was lodged by Ann Clwyd Welsh MP within a week there were 21 signatures. including all the Plaid Cymru MPs, and MPs from conservative, labour, liberals and SDLP parties. 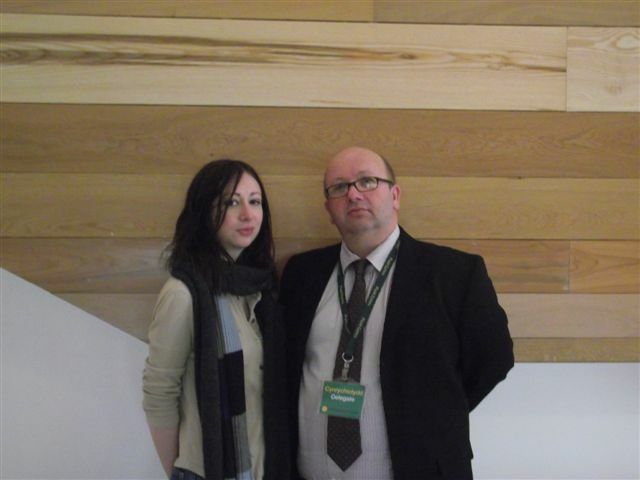 Cllr Rhys Sinnett (Plaid) and Naomi, organiser of UK friends of bradley manning at conference. “That this House expresses great concern at the treatment of Private First Class Bradley Manning, currently detained at the US Quantico Marine Base; notes the increasing level of interest and concern in the case in the UK and in particular in Wales; appeals to the US administration to ensure that his detention conditions are humane; and calls on the UK Government to raise the case with the US administration”. “I have raised the case of Bradley Manning on a number of occasions in Parliament this week. On Wednesday, I raised his case with the Foreign Secretary in a session of the Foreign Affairs Committee. On Thursday, I raised the case with the Leader of the House during Business Questions. I have tabled an Early Day Motion on the treatment of Bradley Manning and I have applied to the Speaker for a debate. “On 10th March, Bradley Manning’s lawyer released a memorandum from Bradley Manning to the Commanding Officer of Quantico Marine Base which described his detention conditions. “Throughout his detention he has been classified a ‘Maximum Custody’ detainee and held in solitary confinement. His ‘Prevention of Injury’ (POI) status means he is kept in his cell for 23 hours a day. His is stripped of all clothing during the night and given a coarse and uncomfortable ‘smock’. He is not permitted to sleep during the day. “During the period when he was classified a ‘Suicide Risk’, he was required to remain in his cell 24 hours a day, his glasses were taken away from him, rendering him blind. “He has been made to stand naked and to attention ‘on parade’ for the Brig Superviser. “This treatment serves no purpose other than to humiliate and degrade Bradley Manning. “His conditions ignore the recommendations of the Marine Corps’ own appointed psychiatrists’ reports. “Bradley Manning calls his conditions “improper treatment” and “unlawful pre-trial punishment”. Human Rights Watch has called upon the US government to “explain the precise reasons behind extremely restrictive and possibly punitive and degrading treatment that Army Private First Class Bradley Manning alleges he has received”. Amnesty International UK has said “Manning is being subjected to cruel, inhuman and degrading treatment. This is particularly disturbing when one considers that he hasn’t even been brought to trial, let alone convicted of a crime”. “Bradley Manning’s treatment is cruel and unnecessary. “I regard myself as a great friend and admirer of the United States. But this treatment of one of their own soldiers ill-becomes that otherwise great nation. “I do not say this lightly, but Bradley Manning’s treatment has uncomfortable echos of the treatment of detainees in Guantanamo Bay. “I implore the US Administration to treat Bradley Manning humanely whilst he is detained. “There is increasing concern about Bradley Manning’s case in the United Kingdom, and in particular in Wales, where Bradley’s mother lives and where he went to school. Ann Clwyd was foreign affairs in previous government and saw enough of Iraq to identify with Bradley. Plaid Preseli condemn the prison treatment of private first-class Bradley Manning in military prison in Quantico, USA. Whatever the merits of wikileaks, eight months solitary confinement and the numerous other deprivations and humiliations he is subject to, against the recommendation of prison psychiatrists and condemned by human rights and mental health organisations, is wholly unacceptable. Jill is the longest standing Welsh Member of European parliament, she is her party’s (Plaid Cymru) foreign affairs spokesperson, chair of CND and president of the European green free alliance (EFA). Baroness Ashton is the foreign affairs commissioner for Europe.